Brattleboro, Vt., from Chesterfield Mountain, N.H. In this view the photographer looks westerly across the Connecticut River (hidden) from the base of Chesterfield Mountain (now called Mount Wantastiquet) in Hinsdale, N.H., toward the town of Brattleboro, Vermont. Many buildings, roofs, and steeples can be seen in the distance. The roof of the Bridge Street bridge can be seen in the photograph, dating the image at circa. 1847 when Easterly made a visit from St. Louis. Plate is signed "T.M. Easterly Daguerrean." 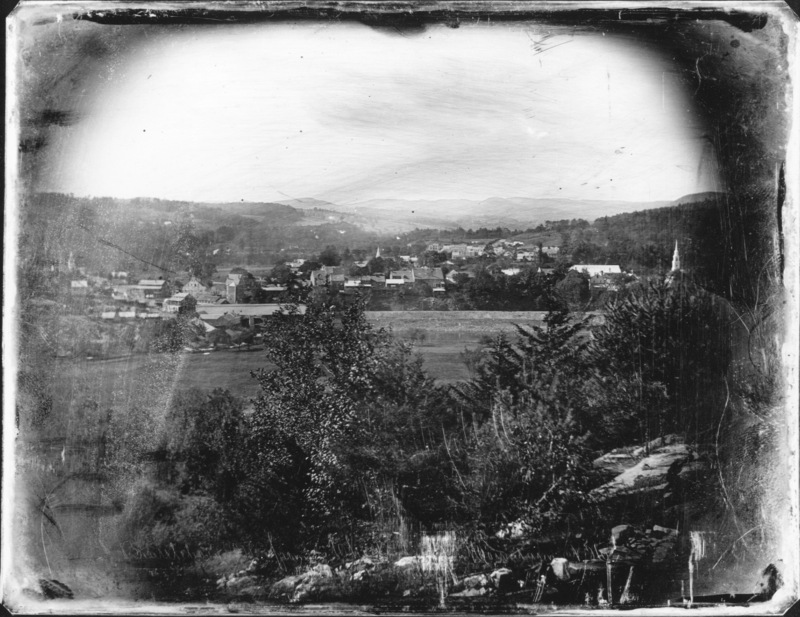 Easterly, Thomas M. (Thomas Martin), 1809-1882, “Brattleboro, Vt., from Chesterfield Mountain, N.H.,” Digital Vermont: A Project of the Vermont Historical Society, accessed April 18, 2019, http://digitalvermont.org/items/show/1100.